Over the years, Load Impact has had the privilege of presenting at various O’Reilly Media Conferences, and we firmly believe they host the best tech-focused events in the world. In 2015, we were lucky enough to present at Velocity Santa Clara and Velocity New York, and we’re excited to announce we’re coming back for more March 8-10 for Fluent in San Francisco! 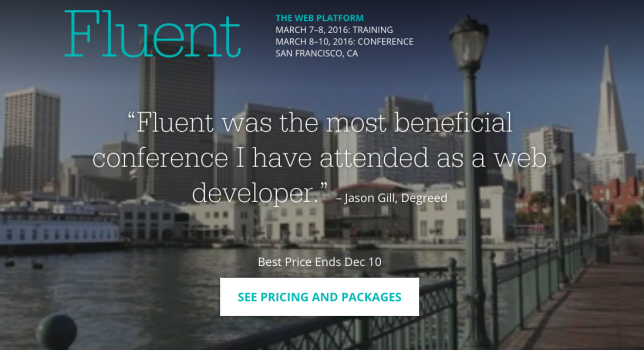 The Fluent Conference is focused on emerging web technology, and that’s precisely why they selected Load Impact founder Ragnar Lonn to discuss his ongoing HTTP/2 research. Lonn presented the initial findings of his study at Velocity NY in October to great reviews from conference attendees and across the web performance world. At Fluent, Lonn will show how his research has progressed with all new data as the adoption of HTTP/2 continues to grow. We’ll keep you updated as the conference approaches, and we’ll surely have news leading up to the big week!